What a terrible novelty Cars 2 is: A bad film by a studio that has been reliably cranking out masterpieces for a decade and a half. It’s almost the reverse of last year’s How to Train Your Dragon from DreamWorks, which was a masterpiece from a studio that has reliably delivered mediocre films. Cars 2 is not the first Pixar film to be less than perfect; A Bug’s Life will probably never be considered a “classic,” and the first Cars was none too compelling. But while fans might argue themselves hoarse deciding which is the greatest of the many magical stories Pixar has brought to life, there isn’t any room left for disagreement about which is their worst. Is this a bad film, though, or merely bad by comparison? Am I just holding Pixar’s movies to an impossible standard (albeit a standard they have set), thus ruining what would otherwise have been a more enjoyable experience? Perhaps, but I don’t believe so. I know what I like, and I disliked this movie after going in with low to moderate expectations. In fact, if it weren’t a Pixar production, I wouldn’t have gone at all. Maybe this movie was simply not for me, though. I am not a fan of NASCAR, or car racing in general, and I know very little about cars beyond how to drive and maintain them. There were definitely jokes and references in Cars 2 that went over my head, but again, I don’t think that’s the whole story. Any movie that genuinely rates a sequel introduces us to a group of memorable characters who inhabit their own unique world. Whatever else we might say about Cars, it did do that much. A good sequel, then, will find new ways for those characters to grow and change, introduce new and interesting characters, and give us a chance to see more of the world they inhabit. The trouble is that Cars 2 only manages the second of those things, and only partially succeeds at that. The most obvious problem is the world of Cars. It’s stupid. It doesn’t make any sense. We didn’t really see enough of it in the original for this to pose a significant problem, but in the jet-setting sequel, it’s impossible to get away from the issue. In Pixar’s other films, their characters inhabit the same world humans do, and much of the imaginative charm of these stories is the way they depict the secret lives of toys, bugs, monsters, fish, rats and what have you as they go about their business undetected. There are no humans in Cars. There are only, well . . . cars. This raised some strange questions. In Cars 2, those questions grow so large that they totally overwhelm the story. Leave aside for a moment the quandaries of a world in which cars presumably manufacture themselves and exist as a sentient life-form that is an end in itself rather than as a mere means of transportation. In Cars 2, the characters journey all over the globe, and we are constantly slapped in the face with the fact that this isn’t just some alternate world inhabited by cars instead of people; it is our world and we have been mysteriously replaced by our vehicles with everything else left untouched. Everywhere the cars travel they are surrounded by recognizable landmarks of our cultures and societies: Notre Dame and the Eiffel Tower in Paris, a rustic Old World village in Italy, Buckingham Palace and the Big Ben in London, etc. So many of these man-made (car-made?) landmarks that the film visits are in cities that have existed for hundreds or thousands of years, but the oldest automobile is, what, 150 years old? Where did all of this stuff come from? Did the cars’ ancestors build it all? Were they wagons? Chariots? Carriages? But the horseless kind, right? Because there aren’t any animals in this world. In one scene, a flock of tiny airplanes flutter away from a fountain, but that’s about it. As these questions started to accumulate, I found it more and more difficult to make sense of anything, and my suspension of disbelief started to implode. 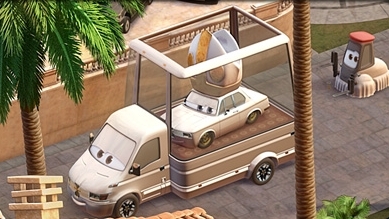 There is a throwaway joke at one point, a cheap laugh, where Mater asks, “Is the Popemobile Catholic?” Then, a few scenes later, we see the Popemobile attending the race in Italy, riding in what is presumably the Popemobilemobile. Wait, what? I had idly wondered a few scenes before why cars would have churches: To worship and observe the sacarments, of course. Was the Jesusmobile wrecked for the sins of all vehicles? Do they gather for the Eucarist and sip motor oil and nibble hubcap wafers? The world of Cars is built on a whimsical but shallow conceit that it cannot sustain in any sort of coherent fashion. I am over-thinking this to an absurd degree. The point is: Whatever was going on in Cars 2 was not interesting enough to keep these sorts of things from distracting me. Maybe I am an anomaly in this respect. Maybe these things won’t bother anyone else. The world of the movie, for all its absurdity, is still gorgeous to behold. Pixar hasn’t slouched in the visual department. So let’s lay that aside and consider the real reason this movie exists: Every year since 2006, Cars has been a multi-billion dollar merchandising bonanza. Cars 2 stands to boost those profits to a degree that exceeds my imagination by exponentially increasing the number of things that can be turned into cool toys, and deploying them in what amounts to a feature-length commercial. Certainly the new major characters are a lot of fun, particularly Michael Caine’s way-cool, gadget-laden spy car and John Turturro’s charmingly arrogant Formula 1 Italian, Francesco Bernoulli. I would totally play with a toy based on Jason Isaacs’ Siddeley the spy plane, or the mad genius Professor Z. There are also some fantastic cameos, like Bruce Campbell’s brief appearance as an American spy car. But so much of the expanded population we see in the movie seems based on paper-thin stereotypes. There are some great laughs in the Cars 2 versions of Japan, France, Italy, and England, but I couldn’t shake the uncomfortable feeling that some of these cultures were being reduced to their broadest caricatures (okay, I’ll stop). That uncomfortable feeling was only heightened by Mater’s character arc. Most of the original characters, though present, are lost in the crowd this time around, but Mater has moved to the fore as a celebration of loud-mouthed American ignorance abroad. As the automotive avatar of redneck culture, it is only natural that Mater’s fish-out-of-water experiences outside of his beloved Radiator Springs would form the comedic center of the movie, but by making him the main character, his abrasive buffoonery becomes the problematic target of that all-too-cliche kid movie moral: Be true to who you are. Early in the movie, Mater’s oblivious and often rude antics are a source of constant embarrassment for Lightning McQueen, and even cause the loss of a race at one point, creating a rift between the two friends. Later on, Mater finally realizes that everyone sees him as an idiot, and painfully recalls his outrageous behavior, prompting him to seek reconciliation. But not so fast, because it is McQueen who comes crawling back first to tell Mater that he doesn’t have to care about what other people think, a view which is further confirmed by the supporting characters. Thus, Mater’s intolerable boorishness and bad manners are affirmed, and even lionized, as an admirable quality. Presumably a character learning that you don’t have to sacrifice your identity to be polite and that it isn’t arrogant or elitist to acquire a little cultural sensitivity is just too nuanced, even for a movie filled with international intrigue in a battle between fossil fuels and alternative energy. I get it. I really do. Cars 2 is a feature-length version of the sequences at the beginning of the first and third Toy Story films, where Andy stages imaginative and outlandish adventures in his bedroom. This is John Lasseter, playing in his bedroom with his toy cars for 2 hours. But there’s a reason the hilarious train robbery scene that kicks off Toy Story 3 didn’t continue into the rest of the movie: It would have amounted to empty, if sporadically entertaining, spectacle from storytellers who have consistently prompted us to develop an appetite for something more, and then delivered that something more. Cars 2 was not an unbearable experience, but I went home hungry. ~ by Jared on June 28, 2011.